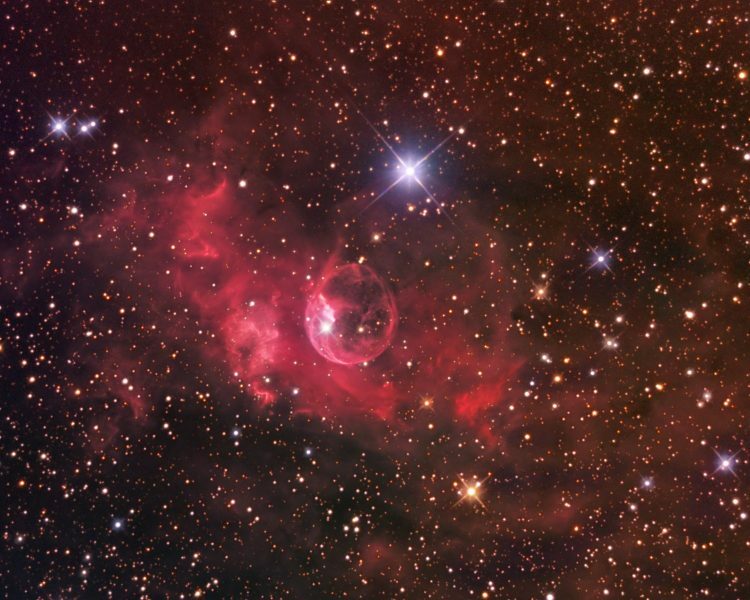 NGC 7635, aka the “Bubble Nebula”, is an emission nebula in Cassiopeia measuring about 8 x 15 arcminutes — it’s approximately 10,000 light years distant. The central portion of the nebula, containing the Bubble itself, was formed through the actions of a stellar wind from a massive central star. Data was acquired in 2007 at MYHY Observatory (in the Philadelphia suburbs) using a 12.5″ OGS RC — all photons were captured using the SBIG STL11K on a Paramount ME. The image includes 6 hours of RGB data. Data reduction was in Maxim, star alignment was in Registar, and subframe integration was via Sigma Combine. All other processing was performed in Photoshop. The image was assembled as an (R)(RGB). For comparison, check out the Ha/OIII narrowband version HERE.